When we first reported on Starbucks’ $500,000+ plan to overhaul its Olive Way store, we asked a lot of questions. We forgot to ask this one — Are you planning to use a crane to install a 16-foot sign on the top of the store on October 13th? If we had, their answer should have been, “Why, yes.” Here’s the news via a media release sent to us this afternoon. “Not sure how compelling that will be for your readers, but thought I’d mention it,” the spokesperson said in the mail. Yes, definitely not a Stealthbucks. WHAT: Starbucks is putting the finishing touches on the newly renovated Olive Way location – a high-profile store in the Capitol Hill neighborhood. 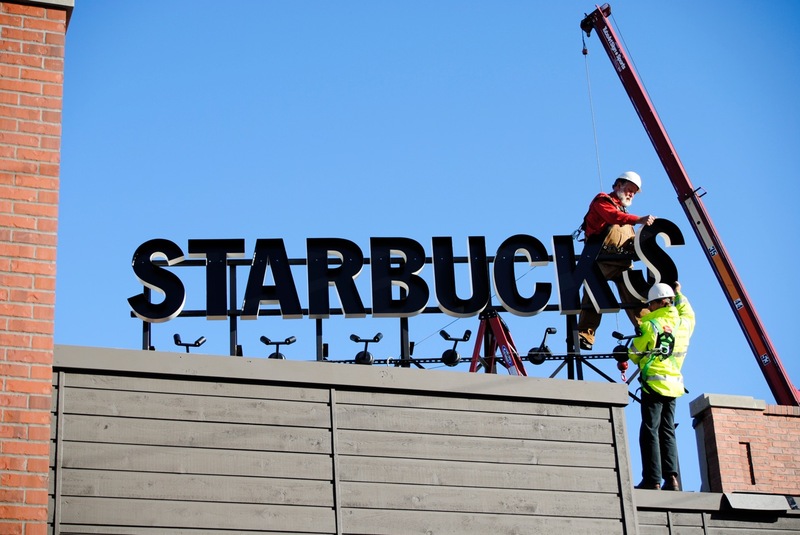 Early Wednesday morning, a crane will install a 16-foot Starbucks sign on top of the building at 1600 East Olive Way. The sign (rendering below) will pay homage to Starbucks roots in Pike Place Market, with a design reminiscent of the famous Seattle landmark. Final preparations are now being made in advance of the store’s opening at 5:00 a.m. on Monday, October 18. That seems grossly unnecessary…Hopefully it doesn’t light or flash like that damn Amante sign (bleh). I like signs like this, they remind me of the movie Empire Records. That was my first thought, too. (Amante’s atrocity should be sabotaged.) It will apparently be lit (as tastefully as could be hoped, I suppose) by lamps at the base of the sign so any light will be relfected. I totally hate the ‘stealthbucks’. This is brilliant though. I think the sign will look good there. That sprawling intersection makes for quite a bit of open space in front of it so a big sign seems appropriate. I get that gay people frequent this Starbucks (it is the hill after all) but I don’t get the Gaybucks reference – at all! Just what we need…another distraction for drivers on Olive Way so they won’t pay attention to the people trying to cross the effin street!!! Though I do like this sign option, I feel it would have been cooler and more of a landmark to have it say “CAPITOL HILL” like the QFC in Wallingford. People would flock to it for photos. Everyone already knows it’s a Star.. I mean, Gay-bucks!!! Or even just the words CAPITOL HILL and underneath it STARBUCKS. I think this is a great addition to the hill. I actually like the sign, seems like it kind of fits the character of the neighborhood. Totally agree w/ SeattleXB, well positioned & designed. yep yep much better idea!! Nooooooo! The QFC “Wallingford” sign is a fake – a take on the original “Food Giant” sign. I’d prefer Starbucks advertise themselves rather than take on the mantle of my neighborhood. I can understand the importance of illuminated signage, but there’s really no need to direct spotlights up into the sky to do so. Surprised this is actually allowed by the City, as they have strict requirements (generally) of shielding fixtures so that wasted light is not lost into the night sky. Agreed. Hearing it called ‘Gaybucks’ all the time is annoying and honestly, I find it quite childish. It’s the hill, everywhere you turn gays and straights are mixing it up together. That’s why I love it. Might as well rename all the coffee places… Gayvace, Gayhaus, Cafe Gayta, StumpGay, GayLadro, VicGayla, Gaerie, ArGaybica. Why stop there? Capt’n Gayz, Rom Mai Gay, 22 Gays, The CanterGayry, GayLuxe, Gayway Grill, Gaynicorn, Gay Stop, Gaysia Express, Gayguette, Gaybird, The GayLight, Chez Gaydy, Gaycake Royal, Elliott Gay Books, Gayleria’s, Gay Mamma’s, Gayjuree, Gayberty, Gaycora’s, Gay Dog, Queen Gayba, Rancho Gayva, The Gaywood, The Gaybud, Gay Arms, Tacos Gaymas, Top Pot Gaynuts. The hole “Gaybucks” thing just gets kind of old. I *wish* there were stores with those names. Amazing! I tried to pick a favorite but couldn’t. ok… maybe “Queen Gayba”. I love the placement of the sign and can’t wait for the place to reopen. However, was it really wise to have a black sign that isn’t backlit there? I have to agree with the light pollution concerns. Sure, there’s nobody whose apartment should be lit up by the spot lights, but it just doesn’t seem to be the best use of energy. I’m just glad we don’t have an Olive Gayden or a Gaybies’R’Us! I consider the design concept to be exceptionally good. It evokes the era in which the building was built, possibly as a home. This picture from VintageSeattle.org shows just a sliver of the building from Olive Way and Bellevue. A much larger home occupied what is now the parking lot. Google Street View confirms that the old pic shows the same building. http://www.vintageseattle.org/2010/02/08/reframe-bellevue-ol . I think it will win awards. Also, I drove by it with my teenage kids last weekend and they thought it was the coolest looking Starbucks they’d seen. Maybe you should take a look at it before you claim light pollution. I specifically walked past there to see this big sign that everyone is talking about, and although I was excited at firsdt, I walked by kind of underwhelmed. I thought it would be bigger. I guess 16′ isn’t all that big all things considered. The store looks fabulous though. I can’t wait to have my neighborhood Starbucks back! Well done ugh. At first I was offended but by the time I got to Rom Mai Gay and 22 Gays I was rolling in my pink suspenders. Too funny! I will kindly submit Gaygrown Sandwiches, Toys in Gayland, Ayugaya and Gayharaja. Are you seriously complaining about Light Pollution? Find a more worthwhile cause or complain about something that deserves it. For example, have you seen the Amante’s sign at the corner of Denny and Olive? That thing screams Emerald Queen Casino. Wasted light or not it is pretty Gaudy! I’m surprised it hasn’t caused traffic accidents. Leave the gaybux sign alone and focus your energy on something else like the viaduct tunnel, getting out the vote, or spaying and neutering your neighbors, not light pollution.